Orkney. I’d heard of it. I even knew the word Orcadian, and I knew there was something in the back of my mind about music and natural history or was it geology. “Okay”, I said. Having finished the conversation I began my Internet search. No, it wasn’t one of the Western Isles – it was north. Far north; as far north as it is possible to go on land and then some more across the sea, but not as north as Shetland. It looked great on the Internet. Four days work there would be an adventure. I booked my flights from home in Devon – I had soon realised that driving was not an option – and felt inspired enough by the tourist information to book an extra day there at my own expense. I met someone I would be working for in London and they told me how historic the place was. “It’s Norse,” she explained, as if that said it all, “There’s not the same Celtic influence there.” I did my research and packed my ski jacket, waterproof thermal trousers and walking boots, just in case. It was April, after all. Getting to Orkney from one end of the UK to the other (well, Cornwall and Shetland are further) was a breeze. A 7:00 am flight from Exeter to Edinburgh, a quick change and off to Kirkwall, the capital city of Orkney by taxi from the airport. Just after 11:00 am and I was strolling in a Viking city. But then I met the people. 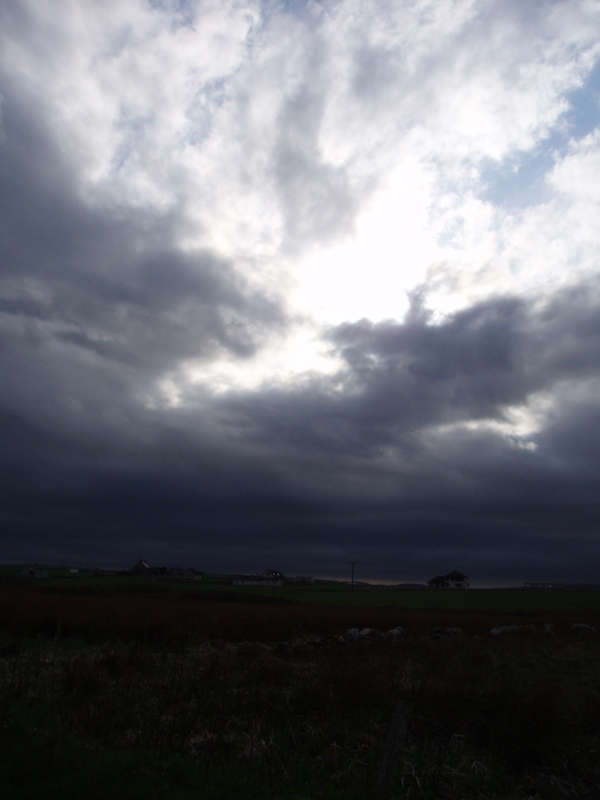 One Response to "Arriving in Orkney"
Now I begin to understand. Your site has so many facets, I’m only just beginning to get how you do things and the Devon/Orkney thing. My grandfather came from Shetland. I go regularly visit a cousin on Lewis, so I know a bit about your feelings about Orkney. The wildernesses draw you back. I have a cousin who went to live on Iona, where he has a herd of black sheep, a very successful totally “green” hostel that attracts artists and writers, etc.,and a custom made bothy where one or two people can be totally quiet but still within easy reach of the hostel. He used to restore antique carpets in Edinburgh! I asked him why he moved to Iona some years ago, and he just said that as soon as he visited, he knew it was the place he wanted to be. I remember thinking how lucky he was to have found it.